Kabayan Hotel Privilege Card - Official Website | Earn points with every stay! Earn points with every stay with the Kabayan Hotel Privilege Card. Book direct with us and get more points. Each point is equivalent to Php1.00 and can be used with any purchase at the hotel. Signed up at the hotel? a. Kabayan Hotel (KH) offers this loyalty and referral program (a.k.a. 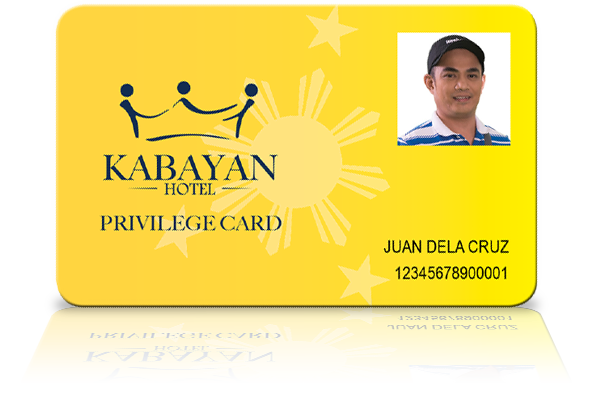 Kabayan Privilege Card) for free to individuals 18 years or older. Corporations, groups and/or associated entities cannot enroll as privilege program members. b. This privilege card is available for guests who have stayed for at least one (1) night. c. One person per card only. d. Employees of Legend Hotels International Corporation and all its subsidiaries, including Kabayan Pasay, are ineligible to participate in the privilege program. f. Complete and accurate guest information will be required during processing of application. The member is responsible to inform Kabayan Hotel of any changes to his/her member profile. By enrolling to this program, it is deemed that the member is giving his/her express consent to receive all kinds of information pertaining to his/her membership, the program and any other offers of Kabayan Hotel. The member is given the right to choose how they would like to receive such communication from the hotel. – Points may be earned through outright purchase of Kabayan Hotel products, limited only to rooms and food and beverage. Earning of points is on a per-room-night basis and will take effect upon check-out. – Guests who booked directly with the hotel thru the official website, central reservations and front office, and official Facebook page may earn points up to 5% of their total purchase for hotel rooms and up to 10% for food and beverage purchases. – Guests who booked thru travel agencies and other online partners may earn points up to 2% of their total purchase for hotel rooms and 10% for food and beverage transactions. – Guests availing corporate and special group rates will not earn points for that particular reservation. – Members may earn 50 points for each referred guest. – Points may only be rewarded for the first stay of the referred guest. Any consequent stay will no longer be eligible for said bonus points. – Referred guests are entitled up to 10% discount on room rates, and food & beverage purchases. – Guests must provide the referral card or a print out of the email voucher given to them by their host Kabayan Privilege Card holder upon check-in. – Referred guests will only earn points for themselves if and only if they sign up for the program. – This offer cannot be used in conjunction with other promos and discounts. a. 1 point is equal to Php1.00, good for spending on Kabayan Hotel products (rooms, food and beverage, etc.). b. Card owners must present their Kabayan Privilege Card to the front desk officer upon check out and advise the number of points that they would like to spend. c. Checking of points can be done at the front office and via phone, email, or SMS. d. Membership points are NOT redeemable as cash. a. Members of the program are entitled to a number of privileges. b. These privileges are offered solely at the discretion of Kabayan Hotel and may change from time to time. c. Current member privileges include the following:- Welcome gift upon sign up- Complimentary room upgrade to next best room category subject to room availability. a. Earned points do not automatically expire, and points are subject to promos and other marketing efforts. b. Transfer of points: Earned Points may be transferred to another individual, given that he/she also has a Kabayan Privilege Card account. c. Merging accounts: In the event that one person applied for more than one account, these accounts may be merged, provided that a letter of consent will be submitted by the card holder, together with a valid ID. d. In case of loss, replacement of card is worth Php150. Earning of points without the card can still be facilitated at the front office. a. Legend Hotels International Corporation (LHIC) and Kabayan Hotel (KH) reserve the right to disqualify anyone from this privilege card program, based on management deliberation and investigation. b. Next of kin: Guests availing the privilege card must indicate their next of kin in the application form, together with his/her contact details (landline, mobile, and email address). e. All benefits are subject to availability. f. Legal or administrative action by appropriate authorities may be taken for program violations, suspected fraud, or abuse in relation to earned points or reward usage. Actions may lead to freezing of account, forfeiture of all points, rewards, and vouchers, as well as cancellation of account or future participation to the Kabayan Privilege Card program. g. LHIC and Kabayan Hotel have the right to add, change, limit, modify, or cancel this privilege card program, the mechanics for earning and redeeming points, rewards, reward levels, redemption levels, processes, benefits, and program affiliates at any time, with or without notice, even though such changes may affect the value of points already accumulated, the ability to use accumulated points, or the ability to obtain certain rewards.